It’s so hard to believe it’s already been a month since my last development update! It’s been a pretty hectic month, but I’ve managed to make some good progress. I also have a bit of time off from my day job coming up and I’m planning to make excellent use of that time. Before I get into my various updates, I wanted to quickly share this awesome prototype of a cyberpunk adventure that lectronice created with RPG in a Box – very cool looking! I think it’s another great example of the many unique styles that can be made with the engine. I’d recommend giving him a follow on Twitter as he has some other great RPG in a Box game projects as well. I always love seeing what the community is making, so feel free to send me screenshots or videos of your game project at any time, even if it’s a small level like this! As you’ve probably seen from some of my previous updates and social media posts, I have been gradually translating the Tiny Dungeon sprites (by Oryx Design Lab) into voxel models as a both a fun side project and to use for a demo of the experimental roguelike mode I’m working on. I finally finished creating all of the models and released the first build of a demo game called Dungeon in my Pocket, which uses these models! Click here or on the image below to download it for free from itch.io. 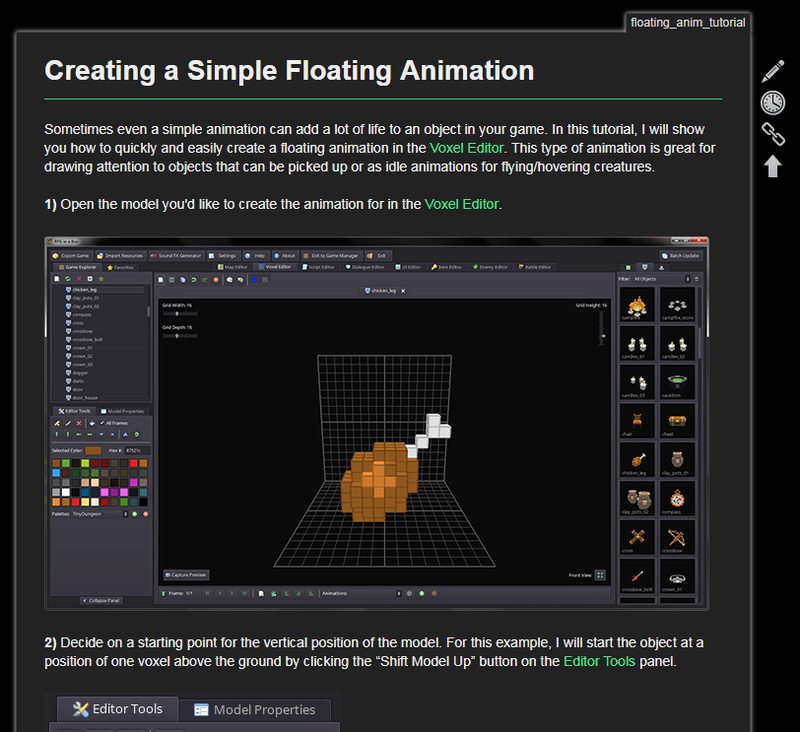 The game is available for Windows, Linux, and Mac. Currently, there’s not much you can do besides walk around one level to kill some helpless monsters and open doors, but stay tuned as I will be adding more to it over time as I build out the roguelike functionality. 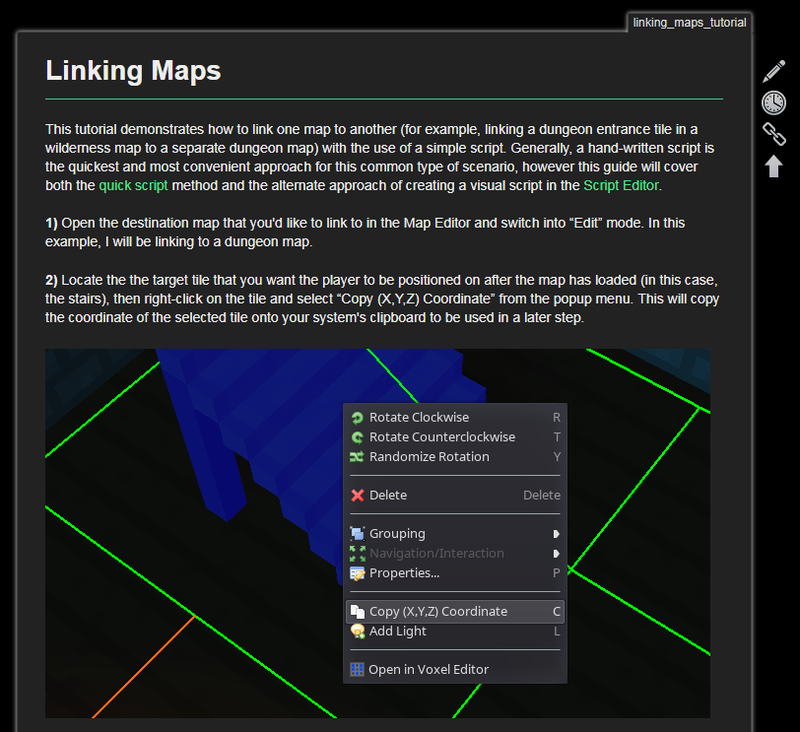 And now for the new features – mostly smaller ones, but some things that should prove useful! Firstly, I added a new scripting function, Add Tile, that lets you dynamically add a new tile into the scene at a particular XYZ coordinate at game time (assuming that one does not already exist at that location), similar to the way you would add one from the Map Editor. The function lets you specify an entity ID for the new tile so you can then reference the tile later in the script, for example to modify navigation to/from it. While on the subject of scripting functions, I also added two related to the player’s health, Damage Entity and Heal Entity. These can be used, as their names imply, to either damage or heal an entity by a given amount. These are useful for things like hazardous tiles and health potions. Damage/healing numbers will now also show above characters to indicate the amount of damage/healing done. The Properties dialog for tiles and objects now has a button that allows you save the entity’s quick script to a script resource file. This is useful for cases where you initially wrote a quick script for an entity, and then later would like to make it a standalone script that can be reused for other similar entities. Another feature added to the Properties dialog is the “On Close Script” option for objects that are marked as an item container. This lets you specify a script that will be triggered whenever the container window for that object is closed by the player (or they walk away from the object). For example, the “On Close Script” for the treasure chest below triggers the “close” animation for itself. Also, as seen in the GIF below on the right, any visual nodes in the Script Editor containing a coordinate parameter now have a “Paste” button that will let you easily paste a coordinate that has been copied from the Map Editor. Lastly, you now have the options of renaming most resources from the Game Explorer’s right-click context menu. This same menu was also added to the resource selection panel on the right for convenient access. 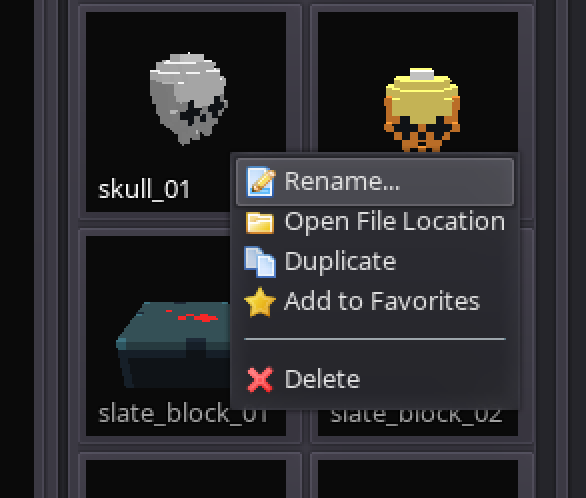 If you rename a tile, object, or character that is used in any existing maps, the application will automatically update those maps to reflect the file name change.